The Second World War wasn't all combat and fighting; scientists around the world were hard at work inventing new technologies and solving problems for civilian life and the military alike. All this invention led to some crazy gadgets along the way. One of my favorite wartime oddities, seen in the August of 1945 issue of Popular Mechanics, shows an engineer from General Electric working on a copper robot, built to reproduce body temperatures. It was all part of a series of experiments to test high altitude flying, which was becoming more and more common with the advent of bombers like the B-29. These high altitudes brought low temperatures and pushed the human body to it's limits. 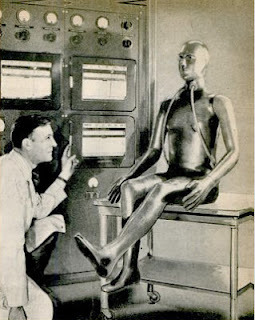 This all-copper humanoid, complete with wires is like a wartime predecessor to C-3PO and brings a whole new meaning to the phrase "my joints are almost frozen."